The five images below represent five views (from five of its six sides) of a solid object. This object has been assembled by gluing together several identical small cubes so that at least one face of each small cube is totally adherent to a face of another contiguous small cube. Each black line shown represents a side of the object that is perpendicular to the plane of this page. Draw the sixth view of the object and calculate how many small cubes were used in the construction of the object, as well as its respective colors. The image for this question is too hard to understand, I can't work out where the dark lines are and judging by the lack of replies, neither can anyone else. I believe the problem picture to be wrong. In the view of the given cube sides, the leftmost of the given sides appears to have black lines between all four adjacent colors on the top and right edges. Logically, 2 other cube sides must have all 4 adjacent colors separated by black lines, one of which may be the 6th cube side. No other given sides of the cube satisfy this. A slightly more elaborate, but likely more confusing, explanation is below. Just for clarity, I will refer to the cube we are trying to solve as the 'cube', and the identical pieces it is composed of as the 'shape'. There are 'x' number of these shapes used to create the cube. (The question is also confusing in that it refers to the shape as a cube). PALMEJ2 - The picture is correct; the solid lines indicate a drop-off where you are seeing through more or less empty cubes. For instance, consider the leftmost face in the picture. 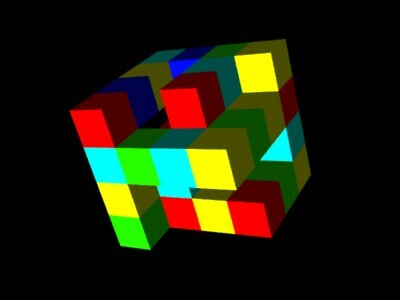 The top-left contains a cube. It will be red from all three sides. The bottom-left corner is missing. You see a yellow cube behind it. From above you would see the yellow cube below it. From the right, you would see all the way through to the red cube that forms the top-left corner. The solution doesn't seem to be unique, but it is the one that uses the least cubes(33). I think there were 5 cubes, 4 turquoise and 1 yellow, that could be added. I found the initial pictures to be correct, although I've used up whatever energy my eyes had left to see where the black lines were. To get the solution give, you have to assume that the two ? blocks are non-existant. Since their view is blocked from the other 5 angles, they could be *any* color, or non-existant. Here is the solution in 3D. I hope it will help.